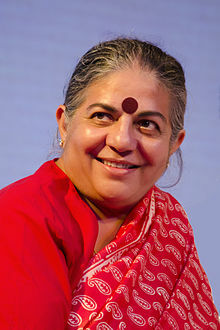 Vandana Shiva was born in Dehradun. Her father was a conservator of forests, and her mother was a farmer with a love for nature. She was educated at St. Mary's Convent High School in Nainital, and at the Convent of Jesus and Mary, Dehradun. Shiva studied physics at Panjab University in Chandigarh, graduating as a bachelor of science in 1972. 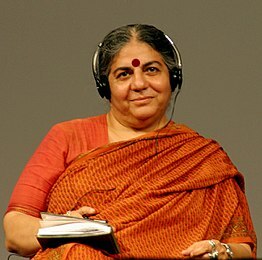 After a brief stint at the Bhabha Atomic Research Centre, she moved to Canada to pursue a Masters in the philosophy of science at the University of Guelph in 1977 where she wrote a thesis entitled "Changes in the concept of periodicity of light". In 1978, she completed and received her PhD in philosophy at the University of Western Ontario, focusing on philosophy of physics. Her dissertation was titled "Hidden variables and locality in quantum theory" in which she discussed the mathematical and philosophical implications of hidden variable theories that fall outside of the purview of Bell's theorem. She later went on to pursue interdisciplinary research in science, technology, and environmental policy at the Indian Institute of Science and the Indian Institute of Management in Bangalore. ^ Schell, Eileen (January 2012). The Megarhetorics of Global Development. http://www.upress.pitt.edu/BookDetails.aspx?bookId=36243: University of Pittsburgh Press. p. 170. ISBN 9780822961727. This page was last edited on 23 April 2019, at 23:01 (UTC).